I love word stamps that take up a lot of space, it makes making a card SO much easier and quicker. Except this one I did have to color in the flowers. Well, I didn't "have" to color them in but they were too blah looking if I hadn't. I only used three markers to color them, so it wasn't too bad at all. The base of this card is a folded half-sheet of Whisper White card stock. On top of that is a 4" x 5-1/4" piece of paper from the "Petal Garden" Decorative Series Paper (DSP) pack. 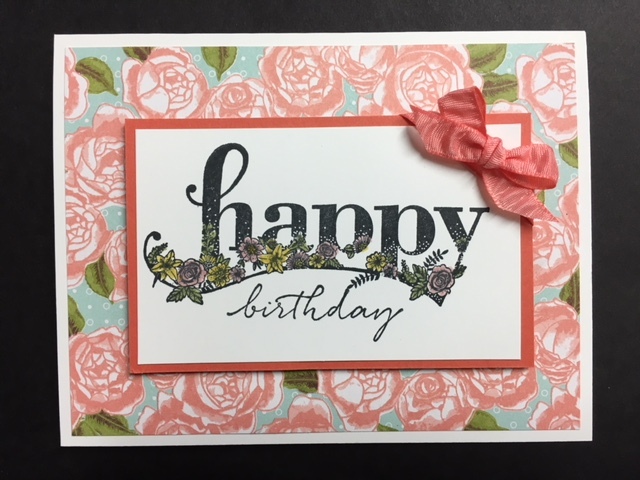 The image from the "Happy Wishes" set was stamped on a 3-7/8" x 2-3/8" piece of Whisper White card stock using black Memento ink. The "birthday" is also from the "Happy Wishes" set. I stamped it below the "happy". Next I colored in the flowers and leaves using Pear Pizzazz, Daffodil Delight, and Pink Pirouette markers. I was going to use Calypso Coral but I thought it was a bit too dark for the small flowers. I layered the word piece using a 4-1/8" x 2-5/8" piece of Calypso Coral card stock. I wrapped a piece of ribbon around the corner and taped it on the back. Then I tied a bow with that same ribbon and set it in place using a glue dot. I set the word panel in place using Dimensionals and the card was done! Not only do large words stamps aid in making a quick card but also busy backgrounds. See how this large word panel toned down the DSP?